Have you gone done Ireland’s longest zip wire yet? 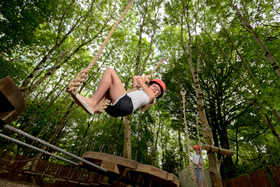 Castlecomer Discovery Park is an 80-acre activity park featuring a wide range of exhilarating activities for all ages, from the fun and challenging tree-top walk high amongst the sycamore trees to Ireland’s longest zip wire! 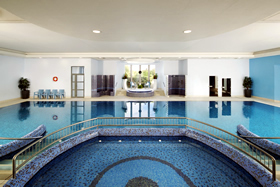 Set on 80 acres of mixed woodland in the former gardens and stable yards of the Wandesforde Estate, it is located in the south-east of Ireland 20 km north of the city of Kilkenny and 24 km from Carlow town, and only 90 minutes from Dublin on the Motorway. There are many attractions for all the family to enjoy. 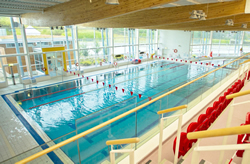 They have online booking, so make sure you to go to www.discoverypark.ie to book online today! Have you taken the Castlecomer Challenge? 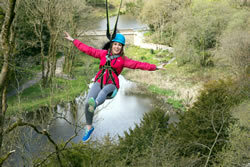 Castlecomer Discovery Park is home to the longest zipline in Ireland! It is 300 metres long and 35 metres over ground at its highest point. Visitors zip over our stunning woodland, two lakes and 17th century hand-restored bridge. 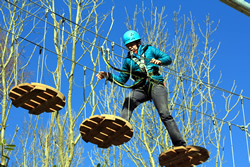 The exhilarating zipline is accompanied by the Octagon High Ropes Course. Set on an octagonal frame over two levels, this presents a series of challenges in the form of nets, ropes, wooden bridges etc. The Octagon is more challenging than the existing Tree-Top Adventure Walk Course. It is particularly suited to groups and for team-building exercises. Contact them to make a large group booking (056-4440707). 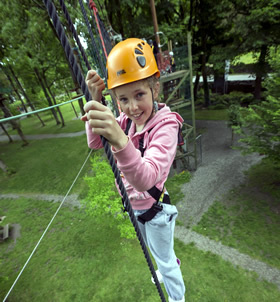 Zipline only is €15 per person (1 turn) or €20 per person (2 turns). 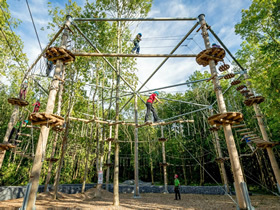 Advanced High Ropes Course only is €15 per person. Try completing the Tree Top Adventure Walk. This activity is one of the most popular attractions kids and families. Walk high above the tree tops, ten metres above the ground, this 140 metre long course gives a birds eye view of the park to those brave enough to take the walk. It is perfect for a family adventure, team building, or school trip. The outdoor climbing wall has various levels of difficulty for all to enjoy. Visitors to Castlecomer Discovery Park can enjoy their boating activities on the larger of the 2 picturesque lakes, in stunning natural woodland setting. The lakes are surrounded by a variety of magnificent trees, and you can admire the backdrop of the beautiful recently restored 17th century stone bridge. The introduction of boating activities gives you the chance to sit back, relax and enjoy the beautiful surroundings of the Discovery Park woodland. So whether you’re after a faced paced or leisurely cruise around the lake you can still fit in some exercise while having fun on the pedal boats and Canadian canoes. Their trained instructors will give you a crash course in how to unleash your inner Robin Hood. Feel at one with nature in our woodland archery range. The Junior Woodland Adventure Course was specifically designed to encourage small children to become more active and adventurous in a woodland environment. Made of natural materials, traditional rope and Larch wood, it is a series of low-risk challenges where children balance and steer their way through the course. It is situated 2 feet from the mulch covered surface. Suitable for 3-8 year-olds, and helmets are provided. FREE to enjoy everyday..this enchanting woodland area is a magical experience for all the family! The Elf & Fairy village has a small yellow sweet shop, cute café, an underground bunker, and an amazing Head Quarters for the fairy folk! It’s full of colourful hand-carved toadstool mushrooms where children can meander through the woodland paths. 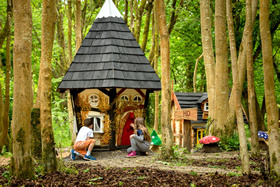 Visitors, of all ages, can enjoy the woodland village which is FREE and is a short 7-10 minute walk from reception. Next to the village is the stunning new hexagonal shaped ‘Bluebell Playhouse. Handcrafted, the playhouse has a number of rustic benches for children to read some of the books from the ‘woodland’ library. As you wander through the enchanting fairy village, why not stop for coffee in the Canopy Café! Open during our high season and holidays, our woodland café has light lunch, gorgeous freshly ground coffee, tea, ice cream all served in a covered picnic area nestled in the woodlands. Outdoors soak up the beautiful nature and wildlife of the 80 acres of mature woodland, which has over 6 km of walking pathways which are accredited national looped walks. Children can enjoy viewing the rare animals that reside in the former walled garden as well as having great fun in the charming Timber Tumbles playground which includes a mini zip-wire and climbing wall, designed especially to reflect the natural beauty of the park. Relax in the beautifully restored stable yard which boasts a wealth of local craftspeople who produce, display and sell their inspiring crafts or enjoy some refreshments in the wonderful family friendly Jarrow Café. They have three permanent courses vary in distance; 1km short, 2km medium and 3km long, each course has a number of codes secured to wooden posts throughout the 80 acres of natural woodland. 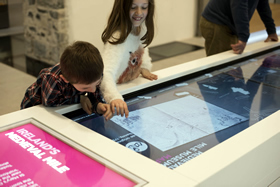 laminate maps can be purchased for €4, participants are shown the answer sheets at the reception desk of the visitor centre on return. This is a self-directed activity, and can be done 7 days per week from 9.30am – 5pm. Harness your inner Bear Grylls and learn how you might survive in the wilderness. Our trained bush craft instructors will challenge you with tasks such as raft building. How would you fare getting off a desert island? Visit the Coal Mining Museum and discover a world where prehistoric amphibians swim and walk through enormous swamp forests, where giant insects fly through the treetops and giant millipedes crawl through ferns and mosses. Discover the coal formed from those forests and the skeletons of those early amphibians preserved for 300 million years. Discover the men who worked the coal seams and those who brought the fossils to light. First through the use of life-sized reconstructions of prehistoric animals and plants, video clips, fossils, rock specimens and information panels, prehistoric life in the coal swamps of the Carboniferous Period is brought to life. Then life sized and scale models of the mines, displays of mining artefact’s, information panels and video interviews with ex-miners and the families of those associated with the mines bring to life more than 300 years of coal mining history. All of this and more is to be discovered in the Coalmining Museum – ‘Footprints in Coal’ which focuses on two distinct but interlinked eras of Castlecomer’s History – the formation of coal during the Carboniferous period about 300 million years ago and the coal mining industry that came much later. Weekends: 10am-5pm (May-August) and 10.30am-4pm (September-April). Last admission to the Coal Mining Exhibition starts 1 hour before closing time. Outdoor Activities are available to book online and have Seasonal opening hours which vary throughout the year. Daily 11am – 3pm during school midterm & Easter holiday breaks. See website and social media pages for latest updates. The Discovery Park’s Education team are delighted to announce the development of activities in the Educational and Recreational programme for primary and secondary school students. The education programmes are fresh, innovative, exciting and make learning fun with specially themed modules which involve everybody. All activities are curriculum linked and they are accredited under the Discover Primary Science Programme. The activities are suitable for team bonding to improve the class room dynamic at start of term or as an end of year activity. New Modules"Castlecomer Discovery Park School Tours"
From the centre of Castlecomer town take the N78 towards Dublin, go over the bridge and after 200m you will see the main iron gates for Castlecomer Discovery Park on your left. Coming from the Athy or Carlow direction, Castlecomer Discovery Park is on the right hand side just before you enter Castlecomer town. There is parking on site for cars and buses. Just follow the signs as you come in through the main gates. Simply send us a message for assistance with planning your Fun Day out in Castlecomer Discovery Park.